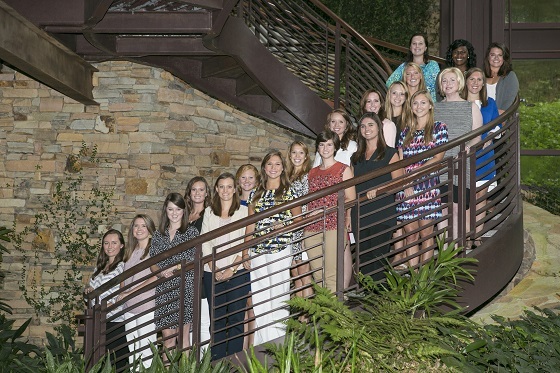 Samford's School of Health Professions welcomed its first class of 20 students in the Master of Science in Speech Language Pathology program on August 17. Students represent eight states and possess baccalaureate degrees from 13 universities. Students spent their first two weeks on campus attending orientation, skills training and validations, and dove into the clinical portion of the program on August 31. Johnson noted that the clinical portion of Samford’s program is a distinctive feature of the curriculum. Admission to the two-year M.S. Speech Language Pathology program is competitive. Prospective students are invited to join the Department of Communication Sciences and Disorders for an Open House this fall. Dates for these events are September 4, October 9, November 6 and December 4. The M.S. Speech Language Pathology application for summer 2016 opens on September 17, 2015 and completed applications are due January 4, 2016. To learn more about this program and specific admission requirements or to register for an upcoming Open House, please visit our website. ** The master's program in speech language pathology at Samford University is a Candidate for Accreditation by the Council on Academic Accreditation in Audiology and Speech-Language Pathology (CAA) of the American Speech-Language-Hearing Association. This is a “pre-accreditation” status with the CAA, awarded to developing or emerging programs for a maximum period of five years. For detailed information about the CAA Candidacy Program please visit the CAA web pages or contact: Council on Academic Accreditation in Audiology and Speech-Language Pathology; American Speech-Language Hearing Association, 2200 Research Boulevard #310, Rockville, MD 20850; 800-498-2071.